Art Pottery & Fine Pottery. Cut & Engraved Crystal inc ABP. Sets of Stemware & Glassware. Elegant Glass - Cambridge, Etc. Geoffrey has been in the business since childhood. He is committed to providing the highest quality glass, china, and other goods available. 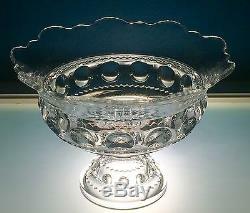 EAPG Adams US Glass XLCR Large Flared Orange Bowl Excelsior Kings Crown Punch. After spending 10 minutes cleaning it, this orange bowl turned in to a real beauty. Guaranteed original from the 1880s. According to Reilly & Jenks, this piece has not been reproduced, probably too expensive and challenging. 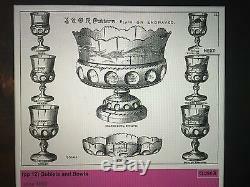 It is shown in a 1892 catalogue to which I added as picture #12. The glass quality is great. John Adams was the first to create a lime glass and lead the glass industry away from flint during a time in which the cost of iron to make flint glass became prohibitive and unavailable due to its need during the Civil War Era. 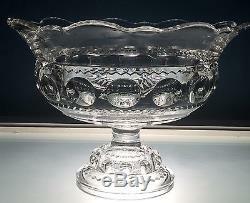 Adams glass created the XLCR pattern in the early 1880s, also known later as Excelsior and later Kings Crown and in some instances called Thumbprint. 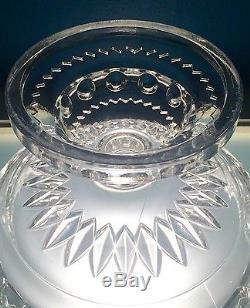 The hard to find Orange Bowl has a flaring rim that is hand drawn. 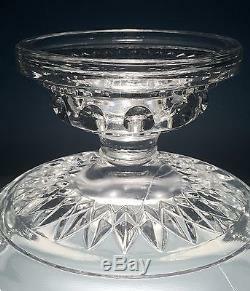 It appears to me that the Adams bowls flare out much more than the US Glass bowls made after 1891, when US Glass took over the Adams factory. Most of the pieces I have seen flare very little and the mold lines are less crisp, indicating the molds had been used much longer and influencing my belief that this is an Adams XLCR piece, rather than a US Glass piece. Contains the joint lozenge between the foot and bowl. This piece is made in two parts and joined by a molten lozenge or disc. This massive piece weighs 7 pounds, 10 ounces. Measurements: 9.25 Tall and 12.5 Across Top. Base is 5.5 Across. Condition: OUTSTANDING - no chips, cracks, or repairs. There is a common strawline from manufacturing in the center as shown in picture. The base shows surface scratching. There is a 1/2 arced scuff scratch on a section of the flared rim. Otherwise just the minutest amount of very light scratching. Everything is in the pictures. Please ask any questions at all. The clarity on the glass is pretty remarkable and casts light well. One thing that is quite unique about the production of this piece is that the flaring of the bowl was done by hand and could vary in diameter and height based on the how the glassmaker flared the bowl. Upside down the base foot is crisply molded and a solid piece of glass. There are no chips on the base, however, there is age appropriate base wear. This piece is made in two pieces and joined using a round lozenge of molten glass, as is shown in the 1892 US Glass Catalogue - picture #12. 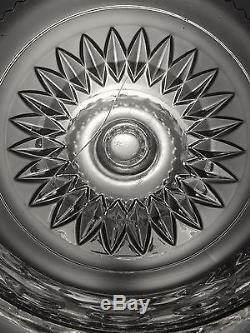 This catalogue was produced shortly after US Glass took over Adams Glass in Pittsburgh and turned it in to Factory A. They continued to produce the XLCR pattern at the factory. 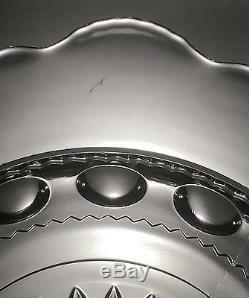 Above: Looking down the flared bowl through the foot. Another angle of the open foot. 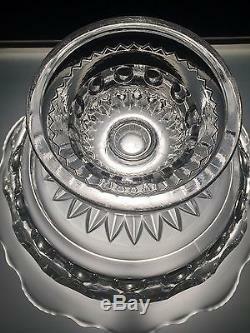 Above: The bowl is upside down and you are looking down through the foot. 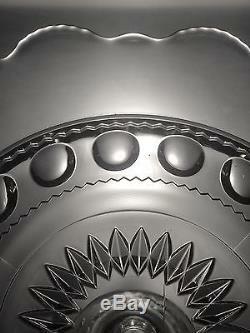 Crisp mold of the center medallion through. Please note the straw line from manufacturing. Above - one more angle of the foot again with the adjoining lozenge between foot and bowl. 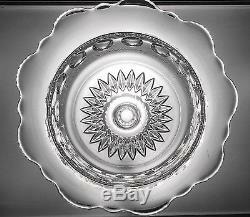 Above: The one noticeable scratch that is on the bowl flare. The higher flares all have the serrated top. Crisp mold - clear glass. Note serration on the taller rounds of the rim. My bowl flares out an extra two inches in diameter - very nice. We offer what we feel are the best options but are open to other preferences you may have. You can always combine and save. Satisfaction on all items or simply return hassle free. _gsrx_vers_625 GS 6.9.7 (625). 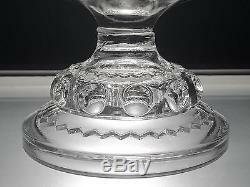 The item "EAPG Adams US Glass XLCR Large Flared Orange Bowl Excelsior Kings Crown Punch" is in sale since Sunday, April 17, 2016. 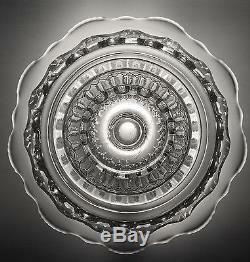 This item is in the category "Pottery & Glass\Glass\Glassware\EAPG Pattern Glass 1850-1910\Other EAPG Patterned Glassware". The seller is "geoffgator" and is located in New York, New York. This item can be shipped worldwide.